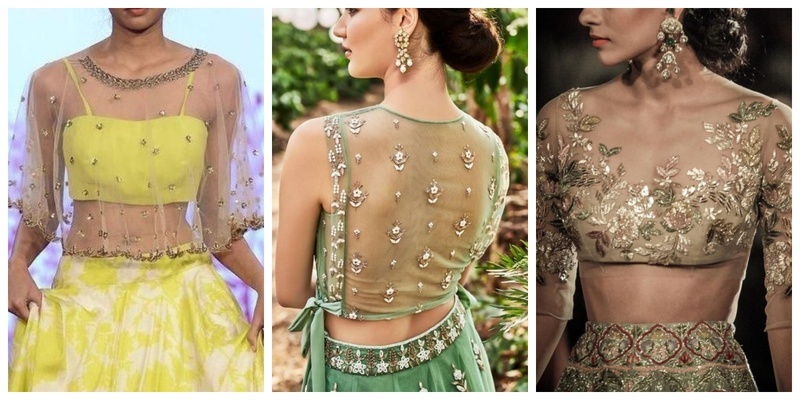 20 net blouse designs to wear with sarees or lehengas on your big day! Net blouse designs are a huge rage in the ethnic fashion world right now! They have a dainty and feminine look, which makes these net blouse designs a perfect fit to pair with all kinds of sarees and lehengas. In this net blouse designs catalogue, I have curated everything from net blouse back neck designs to boat neck blouse designs with net for you to draw inspiration from! This net blouse back neck design is a beautiful illusion you will fall for! It looks as if this blouse is backless with just the golden borders, but guess what? It has a sheer net back that makes it look the way it does. If you are looking for boat neck blouse design with net then your search ends here. This lovely seafoam net blouse design with pearl embellishment, boat neck and half sleeves is just what you need to pair with your saree or lehenga. This net blouse back neck design with gold and multicolour floral embroidery is a modern and attractive design that you can easily pull off with both a lehenga and a saree. This full sleeves net blouse design with lace details with lace details and pearl buttons at the back is an elegant net blouse design that you can pick to wear for your daytime mehndi ceremony! This full net back blouse design beautiful copper bead details and a copper border that makes it look chic and stunning to wear with a designer lehenga. This lovely net blouse design by Anita Dongre is truly an inspiration if you are looking for net blouse back neck designs with sequin details. The tie-up bows at the side just add to the beauty. This gorgeous net blouse design with sweetheart neckline and full-sequin work looks like its off-shoulder, right? All thanks to the perfectly illusioned net work at the neck and shoulders! Want a net blouse design that’s a cape too? If yes, then this blouse with floral embroidery and net cape is all the inspiration you need. A net blouse design with 3D flowers and shimmery sequin sleeves is a total game changer when it comes to latest net blouse designs. Pair this with a pastel lehenga to look like the perfect spring-time bride right out of a Disney movie! A monotone net blouse like this can do wonders to your wedding outfit if it has the right kind of sequin detailing to make you shine and sparkle as the bride! If you are a fan of shiny chrome appilique and net blouse designs, then this stunning blouse is a reference you can show you designer to make the blouse for your big day! If elegance has a face, it would look like this net blouse back design with pearl details. Pick a net blouse design like this one to pair with pretty chiffon sarees! Here’s another net blouse back neck design with cotton sleeves and gemstone detailing that you can choose to wear georgette or chiffon sarees! This net blouse back neck design with leaf embroidery is a stunning option to pair with elegant organza or crepe sarees! Looks like illusion net blouse designs are here to stay! Doesn’t this maggam work blouse with illusion net look like a complete show stopper to pair with a silk saree? If bling is your style, then this net blouse back neck design with embellished cut out design is something you can consider wearing on your big day! This net blouse design with heavy silver embroidery is a chic and stylish choice to pair with a pastel lehenga for any for your daytime pre-wedding functions! If you want net to be just a small element of you blouse design, then this lovely blouse worn by Priyanka that has a ruffled net collar is something you can draw inspiration from! If you are looking for net blouse designs for silk sarees, then this lacy net blouse back neck design is just the perfect choice to pair with a silk saree. This stunning net blouse design with sweetheart neckline and mirror-work sleeves is a gorgeous piece to opt for teaming with a simple net or georgette saree! Did any of these net blouse designs made you want to grab your tailor give him some design inspiration?